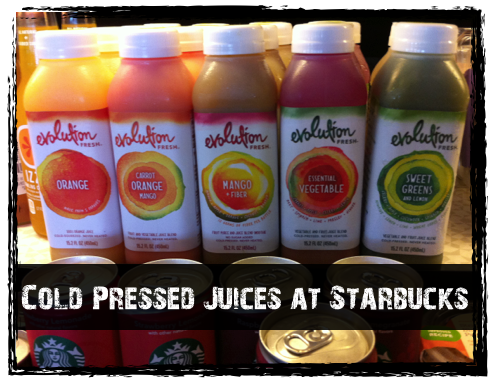 Starbucks Brings Evolution Fresh Juices to (almost) Every Corner. A need for internet access while running errands today had me pop into Starbucks for a wireless fix. I thought I’d buy a water in exchange for internet connection and nearly did a cartwheel at the counter when I saw they had Evolution Fresh juices. This line of drinks is a quick fix for juice-lovers like me, an easy way to get a liquid feast that has not been heat pasteurized. A quick Google search and I learned that Starbucks bought the Evolution Fresh juice line and is distributing them not only to their franchise locations, but also to the same network of stores that receive their coffee products. This means easy access to the yummy line of Evolution Fresh Juices. This is exciting for lots of reasons, not the least of which is that enough people are making healthier choices that Starbucks is willing to throw down $30 million to acquire a juice line and invest additional capitol to open a flagship juice bar. They are doing that because of the market demand from healthy eaters like you. So, hats off to you for tipping the scales in mainstream food and drink options with your choice to include more fresh, healthy options even when you are on the go. If all goes well with the Evolution Juice Bar in Belview, our teens might switch from growth stunting lattes to fresh Cucumber Pineapple Ginger juice. Hooray!! ← The World’s Healthiest Newlyweds!